Since mid January this blogs runs on a WordPress installation in an Azure VM. Because I always thought that the subject is quite complicated this blogpost offers a view behind the scenes. So far this blog (both German and English Version) runs on a hoster somewhere in Germany. The main problem with this hoster was that they didn’t offer Windows Server 2012 R2 and that the contract is only annullable once a year. The annual termination was my mistake when we’ve first signed the contract. There was a monthly alternative but somehow I didn’t choose it. But anyway I wasn’t happy anymore since the communication only works via E-Mail or worse via Fax. Another reason for Azure: I own a MSDN Ultimate Licence including 150€ deposit at the moment. I’m sure I can work with that. After the “pure” installation I’ve fetched my data from the old installation including the “wp-uploads” directory and the theme. My MySQL database was generated with a Powershell Script (I use this one as well for the Backup of the MySQL DBs). I’ve integrated the script later via the HeidiSQL on the Azure VM. Just put the information in the suiting wp-config.php and it runs. With this migration I’ve tried to address the whole domain subject. Until now this blog used to run on “code-inside.de/blog”. For a while I’ve planned to go away from the “Subdirectory” and to an own “Subdomain”. I’ve already blogged about this here. The aim was: Change to subdomains and to the new domain “codeinside.eu” (supporting the European spirit ) The www.code-inside.de just links to the public IP of the Azure VM. 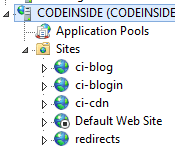 “Blog.codeinside.eu”, “blogin.codeinside.eu”, “cdn.codeinside.eu” links via CName to codeinside.cloudapp.net – which in fact links to the Azure VM as well. WordPress saves the “public” URL on different places – therefore I was forced to use HeidiSQL for some tasks (because I was constantly redirected to the old Admin Dashboard ) or change the values in the configuration. The RSS Feed of this blog is still provided by Feedburner. With the DNS configurations I had to change these values as well.